You are here: Home » Thunderbirds are a GO! In late December 2014, great news for kids of all ages came out. Thunderbirds are coming back to the small screen. This is all courtesy of ITV Studios and New Zealand-based Pukeko Pictures. They are bringing back that iconic series to CITV as well as broadcasters around the world. The, first, season is due to hit CITV sometime in Spring 2015. Not only that, a second season of another 26 episodes have already been ordered even before the first hits the small screen! That showing how much they like it. The second season will hit in 2016 and 17. It is , according to Steve Green, EVP, Kids’ Content and Distribution at ITV Studios Global Entertainment, a mix of GCI animation and models. A mix of the old and the new. I just hope that they have managed to get it right. The last time a classic hero was brought to the small screen was Dan Dare in 2002. That one was fully CGI generated and was good, for the era. It’s not only ITV studios and Pukeko Pictures are in on the act, WETA Workshop are also involved, the people who helped bring King Kong and Lord of the Rings to the big screen. That news alone makes me feel good about the series. Get a company who are known for their photo-realistic CGI. Expect some massive crowds running away from falling building and exploding oil refineries! The cast is almost as good as the companies working on the series. It is lead by Rosamund Pike as Lady Penelope and David Graham reprising his role as chauffeur and International Rescue agent Parker. Inventor Brains will be voiced by Kayvan Novak. Tracy brothers Alan and Scott Tracy are both played by Rasmus Hardiker. David Menkin has been cast as both Virgil and Gordon Tracy. The fifth Tracy brother, John, will be played by Thomas Brodie-Sangster. All in all, CITV have ordered 51, 1/2 hour episodes spread over the two seasons. With the premiere being released 50 years after the series first hit the small screen. The only issue I have is one word in the press release. That being reinvention in the way it described the new version of the iconic series. 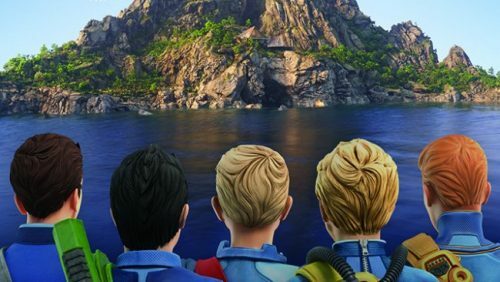 Featuring the world’s most famous family of heroes, International Rescue, Thunderbirds Are Go will see the five brave Tracy brothers piloting their incredible vehicles into impossible rescues across the globe. Not only will you be able to see the series in the UK on CITV but around the world including TVNZ in New Zealand, Australia’s Nine Network, Noga in Israel and pan-Arab broadcaster MBC.